Salon 33 is the latest concept in Rental Salons that provides the salon professional the ability to own their own business and make more money with ease and success. It is the New twist on an Established Industry. Salon 33 takes the hassle and challenges that traditional salon owners face and provide you with a professional, individual, upscale, private, and hassle-free environment that is designed to help increase your clientele and profits…all for the same rate as booth rental, if not less. Would you like access to your own professional studio, fully-equipped with all the amenities to help make you successful? Your Studio will be located in a professional building with visibility directly from I-91 and access to all major highways. 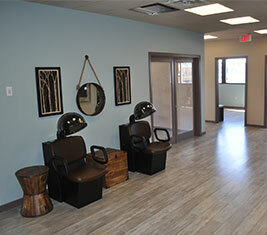 Salon 33 is a unique salon for established beauty professionals with existing clientele. We offer private individual salon studios for you to become a beauty salon owner who wants to make an investment in themselves and their own success!